Elinor Holt plays Anne Hathaway in Thiessen’s one-woman drama Shakespeare’s Will. Photo credit: McDonald Photography. Absence makes the heart grow fonder, maybe. Ask William Shakespeare’s wife Anne Hathaway (Elinor Holt) what she thinks about that. One part history, several parts dramatic whimsy, Canadian playwright Vern Thiessen’s Shakespeare’s Will should not be taken as a pure biography of Anne Hathaway’s life. Think of the play – presented by Sage Theatre – more as an imagining inspired by historical fact. Thiessen’s imagining is primarily inspired by Shakespeare’s last will and testament, an actual document whose phrasing has produced much speculation on the nature of Anne and William’s relationship. On the eve of William’s funeral, Anne is pressured by her husband’s sister, Joan, to hurry home and read his will. Anne is hesitant, however, to read her late husband’s final wishes. Instead, the widow journeys back to when she, at the age of 26, met the young Shakespeare. The 18-year-old writer is, surprisingly, a man of few words, content only to respond with ‘aye’ when speaking with Anne. Despite this, Anne falls for and eventually marries William – Anne’s pregnancy may or may not have fast tracked that decision. Anne and her three children are just about abandoned by William when his theatrical aspirations call him to London. Yes, he sends money and (very brief) letters from the city, but what about the months spent away from his family? What about Anne’s unfulfilled sexual desires? Maybe Anne’s overbearing father was right about not trusting Catholics. After all, William is nowhere close for support when the plague breaks out. Thiessen may not be interested in telling just any old love story, but the play certainly feels familiar. One reason for the play’s familiarity is that at its core, its premise is this: a woman marries an artist whose career takes him far away from home. No doubt, what makes this specific story standout is the mystique surrounding Shakespeare’s personal life. Given that Anne is very much on the periphery of that fascination, more of an answer on an high school English exam than a historical figure, Thiessen’s play feels as though any couple of the same dynamic could replace Anne and William. Thiessen’s rich, flowing language has a rhythm to it that Holt carries wonderfully. Kelly Reay’s smooth direction matches Thiessen’s style impeccably. The director’s strong awareness of space and movement transforms the stage into an almost dream-like sea of memories where Holt is caught adrift. 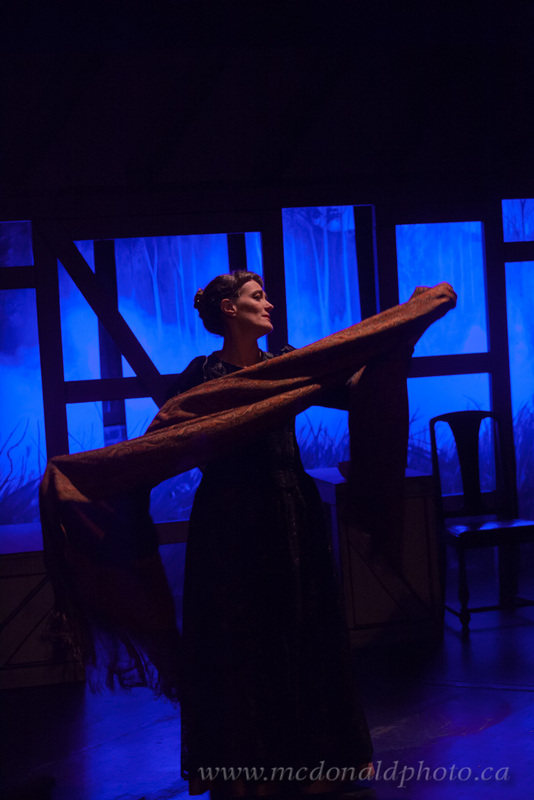 Ajay Badoni’s emotional lighting design plunges the stage further into this ethereal state, to the tune of Allison Lynch’s solid musical composition. Memory is a powerful thing as Holt demonstrates in full force. How Holt so effortlessly sweeps back and forth between Anne’s memories is mesmerizing. Every word spoken feels honest, almost as if Holt were revealing a secret to a friend. Holt truly lives every detail of Anne’s personal history, from the birth of her children to her unhappy encounter with tragedy. Alone, Holt conjures an intimate, stirring performance that almost convinces us otherwise about Thiessen’s loose imagining of history. Ultimately, Thiessen’s springboard for imagination, as he calls it, misses the mark by telling a story about a woman like Anne Hathaway, not a story about Anne Hathaway. Thiessen admits the play is not a proper historical representation of Anne Hathaway, and that apology is founded. Although there is not a vast wealth of knowledge about Anne Hathaway’s personal life, there is still something strange about trying to stage Anne’s perspective when it relies so heavily on her husband’s legacy. Thiessen’s script is written well as it offers plenty for Holt to sink her teeth into, but audiences may feel a lingering disconnect in the back of their minds. Sage Theatre’s Shakespeare’s Will runs Nov 6 – 14 at the Joyce Doolittle Theatre.